Hydrotherapy Tub – Commonly used to treat muscle and joint pain, our hydrotherapy tubs can be fitted with either water or air jets. Chromatherapy Tub – This holistic treatment uses a variety of underwater lighting effects to create an emotional response, including serenity and healing. 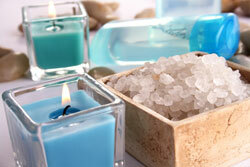 Aromatherapy Tub – Another option for a therapy bathtub is an aromatherapy. Especially helpful for those suffering with anxiety and extreme stress, this holistic treatment used scented beads during bathing to reduce stress and create and peaceful atmosphere. To learn more about our walkin therapy bathtub models, contact our office today. Our trained and informed staff is ready to tell you about our expansive inventory and narrow it down to the selections that are ideal for you.